On Monday, Pope Francis lifted the canonical penalties imposed 34 years ago by Pope John Paul II on the Nicaraguan priest, poet and former member of the Sandinista government, Fr Ernesto Cardenal. The 94-year-old priest is reported to be dying and is currently hospitalised. In a statement, Archbishop Waldemar Sommertag, the Vatican nuncio in Nicaragua, said Pope Francis had “granted with benevolence the absolution of all canonical censures” imposed on the priest. The move rehabilitates the priest–poet whom John Paul II suspended ‘a divinis’, banning him in 1984 from celebrating Mass and administering the sacraments. Pope John Paul suspended Fr Cardenal along with a number of other priests – Maryknoll priest Fr Miguel D’Escoto and Fr Cardenal’s brother, Jesuit Fr Fernando Cardenal. A fourth priest, Fr Edgar Parrales, who was ambassador to the Organisation of American States, requested laicisation. In 2014 Father D’Escoto petitioned Pope Francis and his suspension was lifted. Fr Fernando Cardenal was readmitted to the Jesuits in 1997, after he renounced his membership of the Sandinistas in 1993. 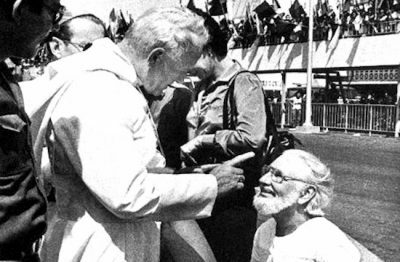 During his visit to Nicaragua in 1983, Pope John Paul II publicly reprimanded Fr Ernesto Cardenal as the priest knelt to welcome the pope at Managua airport. Dropping to one knee and attempting to kiss the Pontiff’s ring, Pope John Paul II pulled his hand back and started to wag his finger at the priest. The incident became iconic for the Polish pontiff’s crusade against liberation theology in Central and Latin America, where the politics of the Cold War saw the US prop up a number of brutal right-wing dictatorships. In 1979 Nicaragua’s newly-formed left-wing Sandinista government had named Fr Cardenal as Minister of Culture while his brother, Fr Fernando Cardenal, was made Minister of Education. Under canon law, “clerics are forbidden to assume public offices which entail a participation in the exercise of civil power”. Fr Cardenal is considered to be one of Nicaragua’s most renowned authors. His works have been translated into 20 languages. He has been awarded a number of prestigious honours including the French Legion of Honour, the Mario Benedetti International Prize, the Pablo Neruda Ibero-American Poetry Award (2009) and the Reina Sofía Ibero-American Poetry Prize (2012). When Fr Cardenal visited the US in 2011 to promote his newest work, his appearances at some Catholic universities were marred by protests by the American Society for the Defense of Tradition, Family and Property, unhappy over his Marxist outlook.